I love how nutrient-packed chia seeds are, so I've been on a hunt for new recipes to make using them. 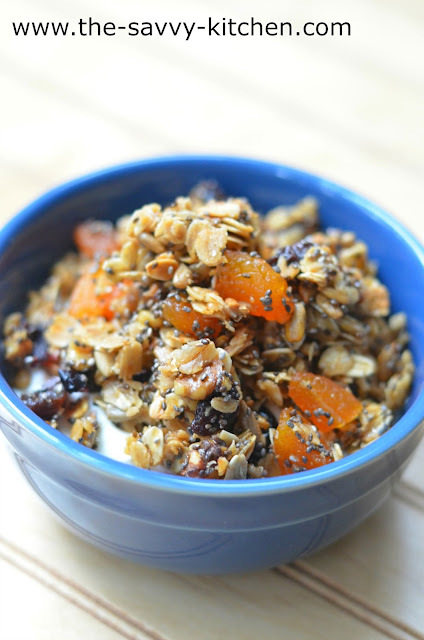 Homemade granola was an obvious choice since Bradley and I both love having yogurt for breakfast, and granola is one of my favorite things to sprinkle on top. It's just so expensive to buy! By making my own at home, I can include exactly what I want in it at a fraction of the cost. 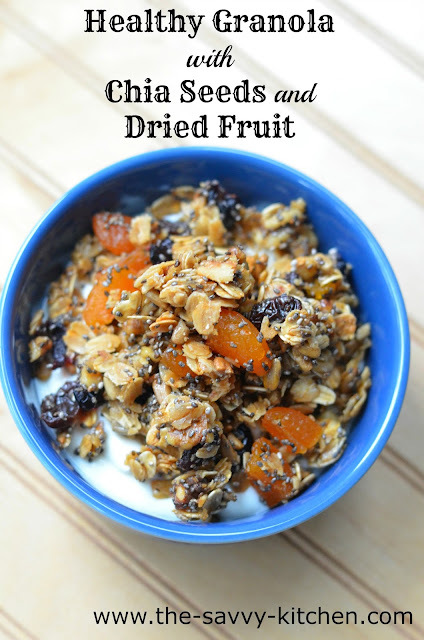 Oats, seeds and dried fruit make a healthy and tasty combination for this. Enjoy! Spread the oats, sunflower seeds, walnuts and chia seeds onto a baking sheet. Place in the oven and toast for 10 minutes, stirring often. Meanwhile, add the agave, sugar, butter, vanilla and salt to a saucepan over medium heat. Cook until the ingredients are combined, stirring frequently. Once the oat mixture is done, remove it from the oven and reduce the temperature to 300 degrees F.
Add the oat mixture to a large bowl. Add the dried fruit and immediately pour the liquid mixture over the oats and fruit. Stir to combine. Pour mixture back onto the baking sheet and bake for 20-25 minutes. Remove from oven and allow to cool completely.